This construction skiff, set up outside Young's Environmental Services, functions as a recycling bin for empty water bottles. 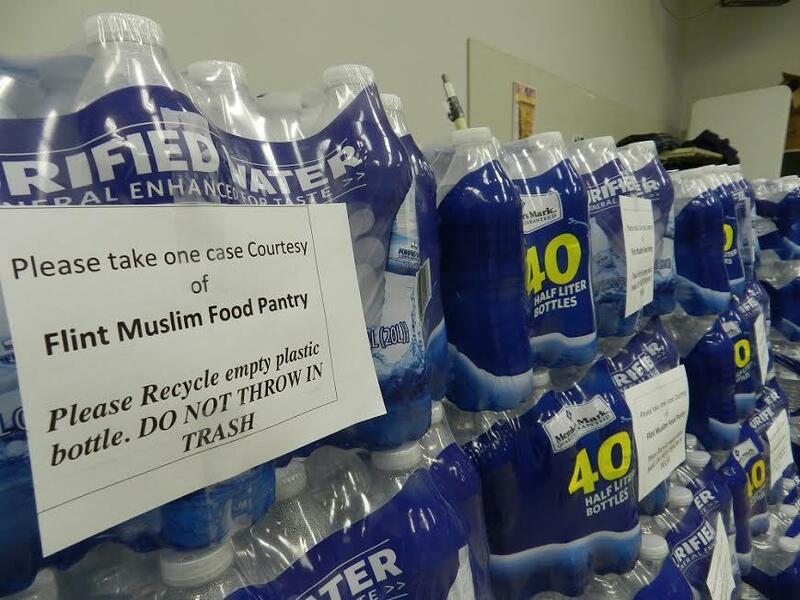 Khalid Iqbal helps run the Flint Muslim Food Pantry. He gives food and bottled water to anyone who needs it in Flint. Last weekend, Iqbal went around door to door handing out water. But he says he and many others were concerned about where the empty water bottles would end up. He says he asked residents what they planned to do with the empty bottles. He says his food pantry is taking empty bottles back to recycle if people bring them in. There have been some rumors flying around – some people have been saying Flint doesn’t have a recycling program. But that’s not true. Flint does have a curbside recycling program. If you live in Flint and you pay for garbage services, you’re already paying for recycling. But the problem is – not everyone knows about it. Gary Hicks is with Republic Services, the company that handles Flint’s waste and recycling. That’s because the curbside recycling program only got started a couple of years ago. Before that, he says, there was no curbside pickup in Flint at all. “Now, two years later, I would say somewhere around 13-16% of the city is participating, so we are gaining ground,” he says. But it’s not automatic – you do have to call the company to sign up for the recycling program and then they’ll send you a bin. Hicks says if you sign up for recycling and have too many water bottles to fit in your bin, you can make your own extra bin. Hicks says they sent out about 20,000 mailers last year to let people know about the program. One consultant says public education is key in getting people to recycle – and in this case – just making sure people in Flint know there is a program. Steve Montle is with Resource Recycling Systems, a group that works with local governments, schools and industries on their recycling programs. Montle says you have to spend money to get more people to recycle. Montle says Flint’s recycling rate is far lower than most developed programs in Michigan (he says typical well established programs have recycling rates of 40-50% or higher). But he says if more people start recycling, it shouldn’t be a problem to handle all those water bottles. In fact, he says adding all those bottles to the recycling system will make it more financially viable. If you live in Flint and you want to sign up for curbside recycling, you can call 1-800-438-0966. In a statement, Republic Services said. "Flint residents who elect to participate in the City's recycling program will promptly receive recycling containers upon enrollment. We ask that residents have their name, address, and phone number ready when calling to enroll." Steve Carmody contributed reporting to this story.